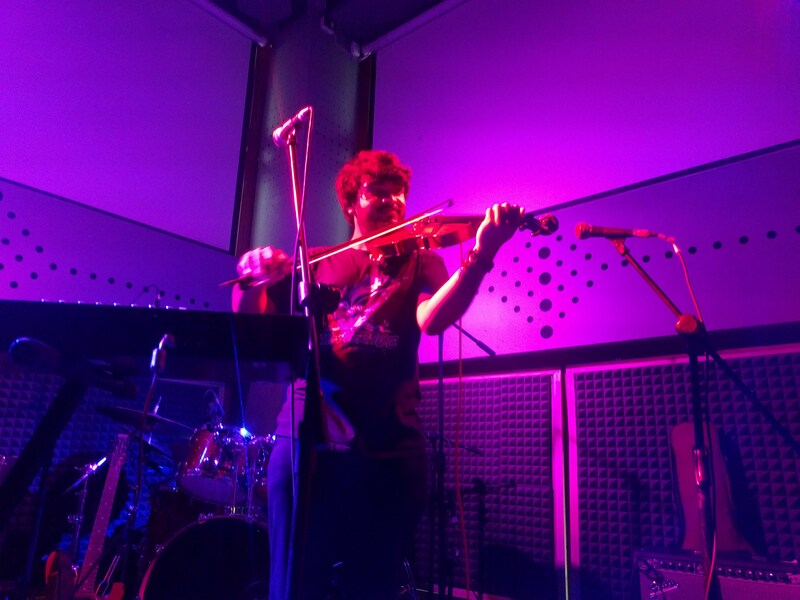 Our last show with Korak was in November, post which he left to pursue his post-doc. After the show, I was out of Bangalore to enjoy my yearly, month-long vacation. Once I was back in Bangalore, we were frantically looking for a drummer. 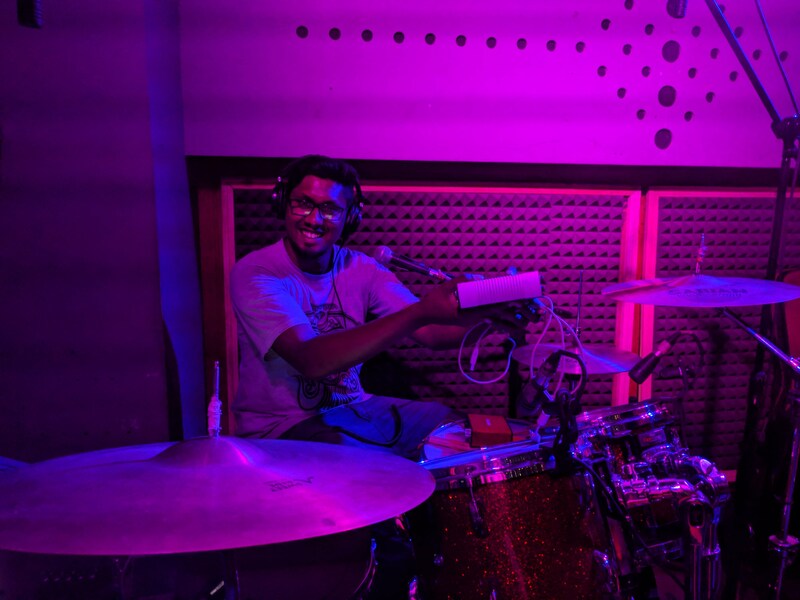 Sudipto did most of the work in connecting with people who were interested in joining the band. One of the key things was to find someone who could lock well with Sricharan, our bassist. We eventually zeroed in on Shawn Jacobs. Once we had our slots filled, we started working on our usual setlist. Most of February went in practicing our setlist until Shawn was somewhat comfortable. 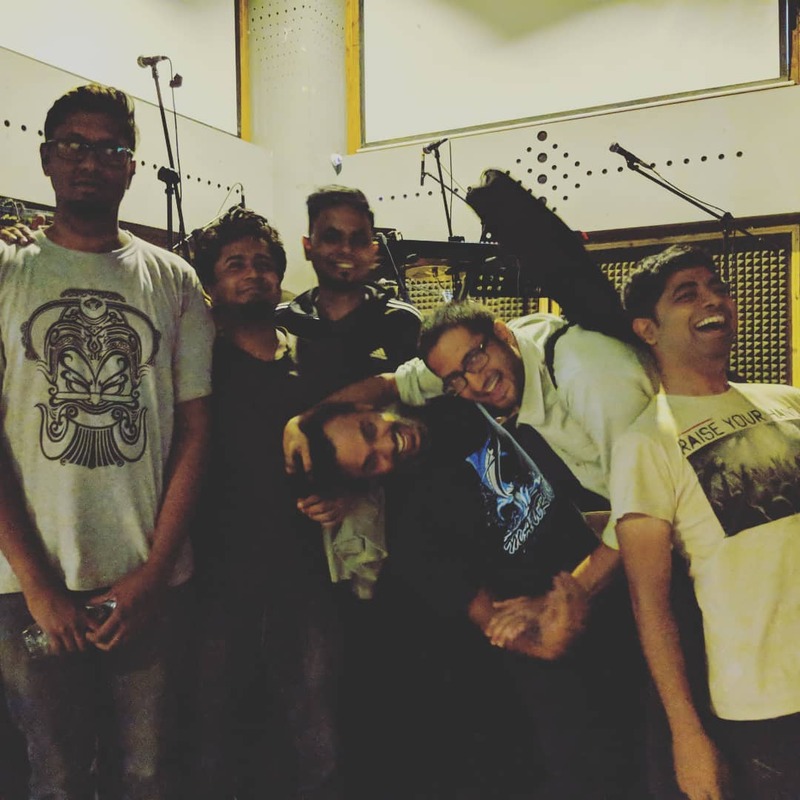 It was during this time that Shounak—the other guitarist—introduced us to Arpit, a violinist who had recently joined IISc. He played along with some of our songs and suddenly our sound felt like it had opened up. One of the challenges we had was to sculpt out portions of our existing songs so that Arpit could showcase his work. This required some significant restructuring and rearranging parts of our songs. On the other hand, we had another hurdle to overcome. Shawn has a very different feel to his playing than Korak. To play tightly as a band, familiarity with one’s fellow musician’s playing style is crucial. Even small bits like stops, gaps and fills that are a drummer’s signature had to be internalised by all the other members. Then there was the issue of adding a MIDI keyboard+computer setup to our existing system. Right from ambient chords, loops and backing tracks, this was a huge jump in our technical setup. Overcoming these challenges led to intense practice sessions, some of which ran way past into my usual sleeping time. For whatever reasons, the pre-gig events weren’t favourable. The soundcheck took too long. There were two things that ate up most of our time. The first was the stock drumset. The heads were off tune and the snare had one of the worst ring to it. This was compounded by the fact that the venue did not have proper cymbal stands. There weren’t any felts on the stand. Instead, a thick wrap of paper tape was all that kept the cymbals from rubbing against the stand. The second was my guitar. The pickups I have are very muddy. The guitar also lacks sustain. I knew that from my practice sessions. Sadly, the boomy mid-range didn’t help in cutting through the mix. It took quite some time for our sound engineer Mriganka to adjust the tone. Later that night, while we were having our dinner, we got to know that a few UG students from IISc had come to the show. 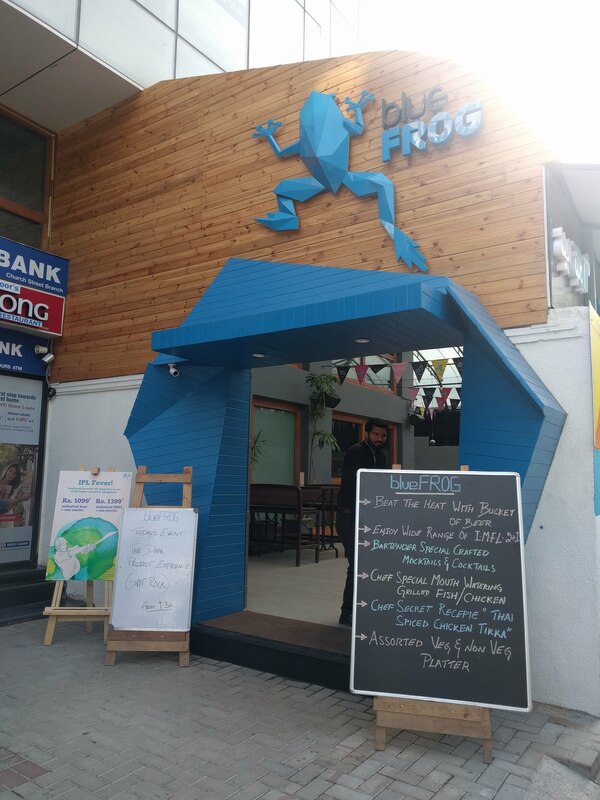 They were not of legal drinking age and blueFROG management did not let them enter the venue as it serves alcohol. We all went out and personally apologised to them. We even promised them that we would refund their tickets once we had the money from blueFROG. Once we were done with our soundcheck, blueFROG recorded a small clip and posted it on their page. I think we played the tightest gig till date. This includes all the new elements that added to the complexity, including a backing track for one of the songs, a series of time-based triggers for another, the violin and the whole idea of having six people, quite a few monitors, a drum kit, a keyboard rig, two pedalboards and three amplifiers on a tiny stage. This was Shawn and Arpit’s maiden show with the band. Heck, it was Arpit’s maiden show; prior to this he had never played an entire setlist. Arpit during the soundcheck. He thoroughly enjoyed his maiden performance. We weren’t able to recoded the gig. There wasn’t anyone to take care of that. However, I saw a couple of audience members take a few videos. Here’s one of them posted on YouTube. By the time I had returned home, it was already 2:00 AM. I had to carry all those equipment including that heavy amplifier and the bulky pedalboard all the way upto the third floor. We’ll sit down this Sunday to analyse the gig and work on various aspects.